A good looking garden deck can make a huge difference to the overall look and feel of your garden – as we can see in our latest case study. Here Roger has used Owatrol solutions to make a statement with the garden decking protected with Textrol and has made it a stand-out feature of the garden. This post has been written by Roger at R & A Pressure Washing Services Ltd., a regular contributor and loyal customer. This yellow balau deck was weathered but untreated so needed cleaning rather than stripping before a finish could be applied. 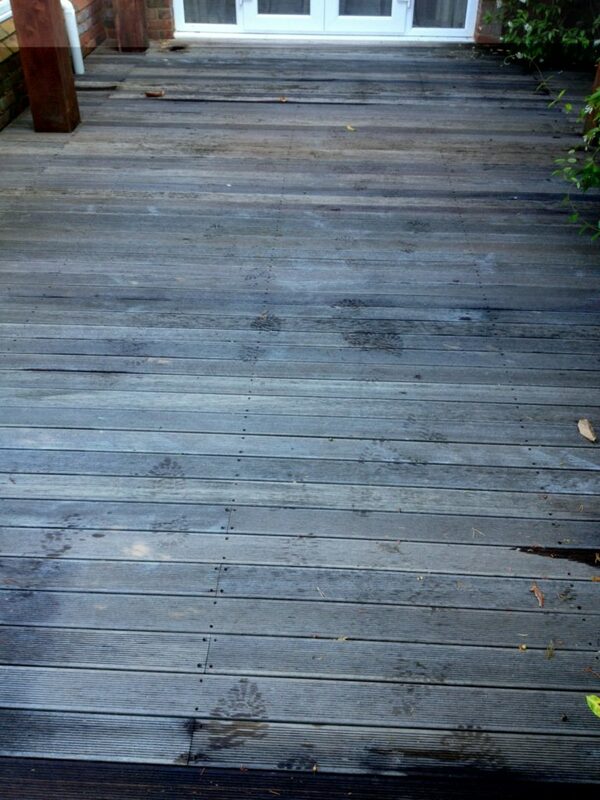 To begin with, Roger used a Prepdeck solution (mixed 1:3 with water) to clean the deck. 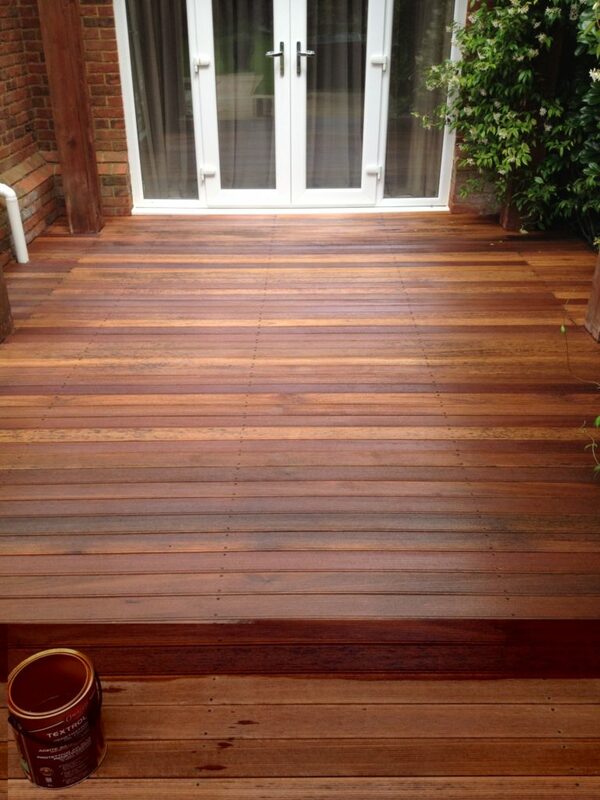 Prepdeck is our wood stripper and cleaner designed specifically for decking. To do this he applied it with a brush, left it to work for 15-30 minutes and then scrubbed the surface whilst rinsing with a pressure washer to remove the built in dirt. After the deck was cleaned it was necessary to neutralize the wood and brighten it with Net-Trol. To do this Roger applied it with a brush, left it again to work for 10-20 minutes and then rinsed whilst scrubbing in the direction of the grain. It is sensible to work in sections which can be completed in 20-30 minutes, particularly with a large area to cover. Roger chose Textrol in Golden Oak tint for this project to get a rich and warm tone that’s not too dark. Textrol is a saturating wood oil which penetrates the wood to protect from within against damage caused by exposure to UV rays and adverse weather. Maintenance is simple with no stripping or sanding required so it can save a lot of time in the future. 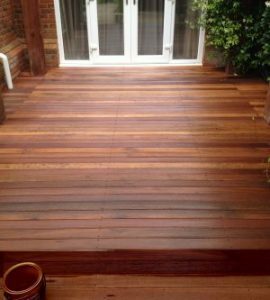 Roger’s customer’s deck is 70 square metres so he needed approximately 15 litres of Textrol to cover it with a multi-coat application. Textrol is applied ‘wet-on-wet’ which means that you apply the first coat and then follow with the next as soon as the first has been absorbed into the wood (i.e. do not allow it to dry). You continue in this way until no more oil can be absorbed and the wood is saturated. At this point wipe away any excess to avoid shiny spots. When applying Textrol you need to work in areas that can be completed in 15-30 minutes in order that you can be ready to apply the following coat before it dries. The finished look is a considerable upgrade from the beginning we think you’ll agree and makes the space perfect for entertaining and al fresco dining with friends. Our team are ready and willing to support you with your requirements whether it is protecting your newly laid deck or renovating a luxury yacht, whatever the application Owatrol US has the solution you are looking for. Not sure which product to use?